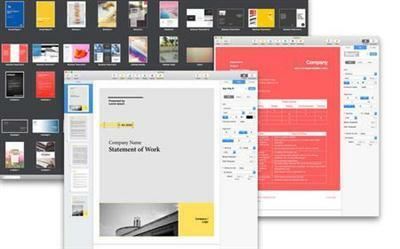 The premium-quality Templates for Pages - Guru Templates selection offers 87 beautiful and functional designs for Apple's Pages. Themes for Pages - Templates Guru - brochures, reports set gives a large selection of templates from Invitations to Posters and Brochures. Some templates consist of up to 6 different pages, so the package provides a variety of around 200 layouts to meet your most diverse needs. Each and every layout - from the quintessential elegance of text-only pages to the bright mix of pictures and slogans in the poster and brochure templates - features prime design quality, set apart by attention to fine points, high usability and abundant creativity. All templates are available in the popular A4 (210 x 297 mm) and US Letter (8?? x 11 in.) sizes, except for non-standard size documents such as landscape brochures (DL Envelope format - 110 x 220 mm / 4?? x 8?? in. ).